Source: Mexico, Madascar, Puerto Rico. Handling Tips: Vanilla beans will keep indefinitely in a cool, dark place in an airtight container. Don't refrigerate beans as this can cause them to harden and crystallize. 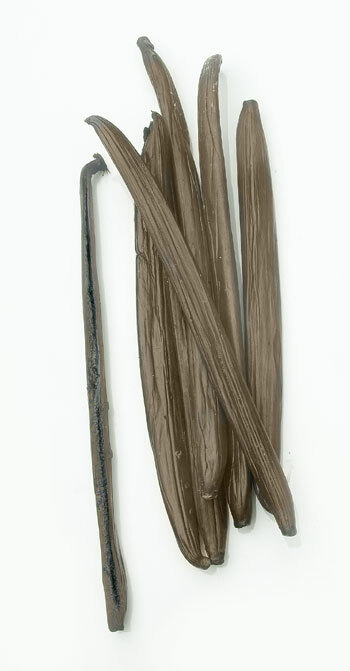 General Information: Vanilla beans are native to tropical America. There are over 150 varieties of vanilla orchids, but only two species are used commercially to flavor and fragrance foods and beverages -- Bourbon and Tahitian. Bourbon beans are botanically known as Vanilla planifolia or Vanilla fragrans and originally came from the Gulf Coast of Mexico. When grown in Mexico they're called Mexican beans. On the other hand, beans from the same plant stock are called Bourbon beans if they grow in Madagascar, Indonesia, and many other regions. The big exception is the beans from Tahiti. Even though Tahitian vanilla is now considered its own species, the original plant stock also came from Mexico. Applications: The entire bean is filled with flavor and, in fact, the pod has more flavor than the seeds. You can cut the bean and use a portion at a time or you can use the whole bean, depending on the depth of flavor you wish. To cut open a bean, lay it flat on a cutting surface. Holding one end of the bean to the surface, carefully slice the bean open lengthwise. When you separate the bean, thousands of tiny seeds are exposed. This step shows why it is technically a seed-pod rather than a bean. By cutting the bean open before placing it in a liquid, more of the surface of the bean is exposed, and the greater the flavoring properties. History: The first written documentation about vanilla came from Bernal Diaz -- Cortes' assistant -- and Bernadino de Sahagun, a priest who came to New Spain (now Mexico) in 1529.